I support many local groups and all of them are worthy causes run by passionate people. The Village Fine Arts Association is one of those groups. They have an annual art competition that is worth knowing about, especially if you are a Michigan-based artist. Below is their press release about this upcoming event. You’ll see more about it here as it draws closer, but the deadline to enter is coming up, so read about it now. “Views and Visions” all-media art competition and exhibit. In collaboration with the Huron Valley Council for the Arts (HVCA), this popular show will hang in the HVCA Gallery beginning with the opening night celebration at 6:30 pm on Friday, November 1 through Wednesday, November 27st. This show is open to all Michigan artists and includes the “Fresh Visions” category for artists under 18 years of age. Each artist may enter a maximum of 3 pieces and have the opportunity to earn cash awards with a top prize of $400. Entry deadline is September 21st. We are pleased to have as this year’s judge Robert Perrish, an award-winning designer, sculptor and painter. He is a co-founder and active member of the Michigan Plein Air Painters. He has been highly awarded for his outstanding work which has appeared in national magazines, calendars, books, limited-edition prints as well as in various art galleries. See his work at www.robertperrish.com. 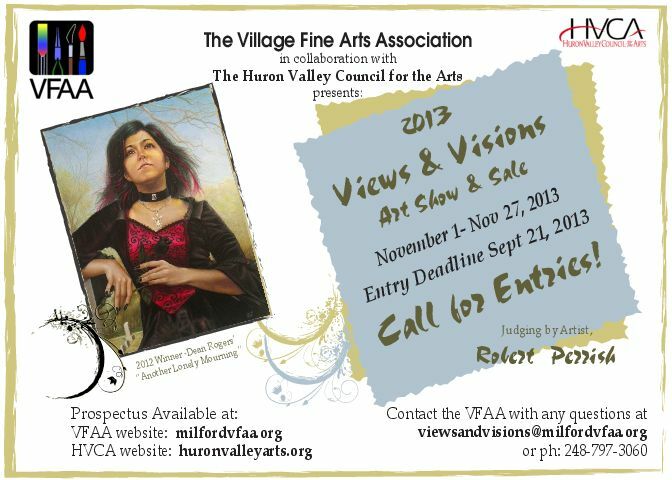 The prospectus with all entry information is available online at the VFAA website www.milfordvfaa.org or pick up a copy at the HVCA Gallery located at 205 W. Livingston Road in Highland, Main Street Art in Milford, or at Miller’s Artist Supplies on 12 Mile Road in Farmington Hills. If you have any questions or would like a copy of the prospectus mailed directly to you, please contact the VFAA at their website or call Sue Gollon, VFAA Executive Director at 248-797-3060. Enjoy a guided tour of Oak Grove Cemetery on Thursday, Aug 22nd and Saturday, Aug 24th Learn about the exceptional women of Milford, their stories and accomplishments spanning 175 years. Thursday tour begins at 6:30 p.m. and Saturday’s tour will begin at 1 p.m. Tours are Free. The Friends of Haven Hill will be hosting their festival on Saturday, Aug 24th. the hours are 10 a.m. to 3 p.m.
1860’s Era Base Ball Exhibition Game – games begins at 1 p.m.
September 12th – General Membership Meting at Milford United Methodist Church on Atlantic St. Pot luck dinner at 6:30 with the meeting starting at 7 PM. Our guest speaker, Don Wilson, will discuss the Evolution of Bicycles. September 21st & 22nd – Home Tour – visit five historic Milford homes, as well as the Museum, the Pettibone Creek Powerhouse, the Log Cabin next to the Firehouse and Oak Grove Cemetery. The homes are open from 11 am until 5 pm both days. Click here to see the poster for this event for more information. I’m not sure that I understand how someone can come to that conclusion or state of mind, which requires a moral compass with no grounding, just spinning in the wind. It does, however, help explain why it is so easy for so many people to blow off traffic signs and fail to stop at Stop signs or yield at Yield signs or to ignore the speed limit. Apparently in their minds it is OK for them to ignore those laws or rules or signs because they have decided that it is OK – moral relativism at work. At the base of this way of thinking is a total lack of any kind of moral foundation for life. It is a very self-centered point of view, because it is based upon only what the person feels is right for them and not within the context of the society in which they have to live. Everyone is self-centered, one cannot not be that way; however, to the extent that one can also be aware of and sensitive to the needs and requirements of others around them, as well as aware of the rules and laws of the society that we must live in; we exist within a society. More egregious transgressions against others, such as robbery or doing bodily harm are thus labeled “anti-social behavior”; and they are more easily identified and avoided by most. It’s the little things (rules and laws) that are the easiest to rationalize away. I’m in a hurry, so it’s OK for me not to stop at every sign. I need to get somewhere quickly, so it’s OK for me to speed. I pay a lot of things so it’s OK for me to accept the wrong change for a purchase and not return the excess. And so on and so on. 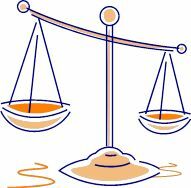 After a while our moral borders can get pushed out pretty far – moral relativism. I suspect that the battle against moral relativism is constantly waged in most people’s lives. A key to winning that battle, or at least fighting the good fight, is to have a solid moral foundation to begin with. For most that begins in the home and is reinforced and strengthened in the church and in school. The natural tendency of children to seek acceptance and to strive to understand what is right and thus worthy of parental, clerical or teacher praise is a powerful building block of a good moral compass. Sometimes the fact that parents understand that their children are looking at them and their behavior can also be a great influence on the parents to do the right things. So, parents; reject moral relativism and do the right things in front of your children and in life in general. If you need help with this, there are many books that have been written by great philosophers about morals and human behavior; but, perhaps the best book to start with is the Bible, one of the greatest books every written to guide one into doing the right thing. Start there and you can’t go wrong. Wow, the summer is going fast. Milford Memories is history and school is about to start. We’ll have one last summer fling over the Labor Day weekend and then it’s back to a more normal pace. There are lots of smaller events coming up in the area, but the next big thing is the Milford Home Tour weekend. Home Tour is on September 21 & 22 this year. I’ve included the home tour poster below. You can click on the graphic to see the full size view. Home Tour weekend is big because there is so much going on in the Village that weekend. The Home Tour itself is on both days from 11 Am until 5 pm. As always, there will be 5 of Milford’s wonderful old home to go through. In addition the Museum will be open both days, as will be the Log Cabin next to the firehouse and the Pettibone Creek Powerhouse. There will also be walking tours of Oak Grove Cemetery. See the Milford Historical Society web site for more details on the houses and the event. I’ve included the event poster below. Click on it to see it full size. Then, on Sunday the Milford Car Show will take up all of Main Street between Commerce and Huron, with an expected 300 cars of all sorts expected. There are car categories covering everything from old, original antique cars through modern street rods. It’s the largest car show in the area every year. Also on Sunday, there is a Tractor Show out at the Huron Valley State Bank parking lot near the corner of Milford Road and GM Road. Tractors of all sorts show up at that show every year. Finally, the Rotary Club of Milford will have its annual Duck Race on a tributary of the Huron River in Central Park. Thousands of little, yellow rubber ducky’s will be bobbing furiously towards the finish line. The activities kick off at 11 AM and the race is at 2 PM. The winning duck will pay out $2,000 to the lucky owner. Get a duck race ticket from any Rotary Club Member and get in the race. Tickets are $5 or a package of six for $25 or a bag of 30 for $100. For more, see their Facebook page. So mark that weekend in your calendars as another weekend to spend in Milford. There’s lots to do and you can enjoy all of our great restaurants on Saturday and most of them on Sunday. Plan on stopping in for lunch between visits to the Home Tour houses or while you are seeing all of the cars on Sunday. Several reports from various industry sources seem to reinforce the notion that the housing market is moving back towards equilibrium from it frantic pace of recovery early this year. The prime indicator is the lack of a big jump in prices between June and July of this year. Prices still went up, but not by double digits as was the case earlier in the year. I suppose that a would-be home seller might like the rapid recovery to continue a while longer, but it is really a good thing for the market overall that it pause to cool off a bit. The rapid run-up of home prices, combined with an increase in mortgage rates served to lock out many first time buyers. There was also a bit of” wait for it to go up more” greed going on that kept the inventory low and fueled the value increases. Many of those who waited may find that they will not be any better off and may have missed the very buyers they were hoping for. One segment of the potential buyer pool – those who felt that they had to buy and get in before school starts in September – have already made their selections. Closing by September 1st pretty much meant that you needed to have a signed deal by August 1st, in order to allow enough time for the mortgage company to get the deal underwritten. The “prime” selling season is generally in the months of May, June, July, and August; however, the good selling season lasts until Halloween. After Halloween, things slow down quite a bit as people start focusing upon the Thanksgiving and Christmas holidays. After that it’s winter, which is always a slow home sales season. So we still have some good selling months left in 2013, if you were thinking of selling and we have some more stable months ahead if you are looking to buy. Mortgage rates have stabilized a bit, although they are expected to continue a slow upward creep. More inventory of homes is coming on the market, which is good for buyers, too. Home builders have also cranked up production, so more brand new homes are available, or will be shortly. This month on my web site www.movetomilford.com I’m featuring the Blue Grill restaurant in Milford. http://www.thebluegrill.com/. Owner Dimitri Mansour visits Detroit’s Eastern Market several time a week to buy the freshest produce and fruits to serve in the Blue Grill. If you like Mediterranean food this is the place to go in Milford and the surrounding area. Food like that served at the Blue Grill is something that you develop a taste for. I lived in Iran in the Middle-East for a couple of years (many, many years ago) and can attest to the great differences in foods and preparation and the tastes involved when you experience a completely different culture. Some of our favorite foods even today are receipts that my wife Carolyn picked up in Iran and brought back. They aren’t things you’ll ever see on regular restaurant menus. Mind you that Mediterranean fare isn’t for everyone. Some people don’t like hummus and farfelle and shwarmas and it may seem that there is always lots of garlic; however, for those with a taste for something other than American comfort food and something made fresh every day this is a great change of pace. Their salads and rice bowls are great and the pitas, made to your specifications are always very good. There is also a large body of evidence that Mediterranean foods are healthier for you than most of the standard restaurant fare and certainly better for you than almost all of what is served at fast food places. The real proof of the pudding for any restaurant can be found in its customer reviews. There’s no way to really fake it for long when then Internet supplies people (customers) with such an easy way to share with others what they liked or didn’t like about a place. The Blue Grill has marvelous reviews and this year won the Talk of the Town 5-star award for customer service. You don’t get 5 stars unless you provide satisfying food and great service. In addition, the Blue Grill is rated as Milford’s top restaurant on the TripAdvisor.com site. There are many other sites that rate local restaurants and I visited a few. The Blue Grill gets those consistently high marks from the most important reviewers – its customers. So, don’t go to the Blue Grill expecting elegant sit-down dining. There are places to sit, but you move through a line “Subway-style” to order and get your food and there are only a few desserts if you are into dessert. Drinks I already mentioned are restricted to pop or water. The reward is when you do sit down (inside or outside in the summer) and dig into the generous helpings that you have carried to the table – really good food at really good prices and served in really generous portions. What more do you really go out to eat for than that? You are currently browsing the NormsMilfordBlog blog archives for August, 2013.